Flat roofs are much more predominate in commercial construction than in residential construction. As a general statement they do not give the visual impact that a slopping roof does. However, there are many homes that use flat roofs, especially in areas that have dryer climates. The elimination of the rafters found in slopped roof construction, both in labor and material does present some economics. Incorporates a fabricated or made on site waterproof membrane to protect the building from water ingress. 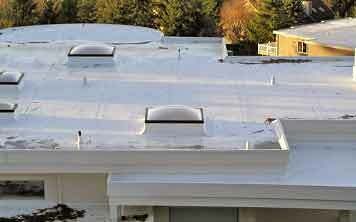 The installation of the protective, waterproof membrane on a flat roof is generally not a project for a home handyman. BUR (tar and gravel roof) involves layers of tar impregnated roofing felt rolled out on the roof, as shown in Figure 2. Each layer overlaps the previous layer. In between the deck material and each layer of felt a layer of hot tar is mopped over the surface. A final layer of crushed gravel holds the roofing to the deck and helps protect it from the suns destructive ultraviolet rays. Depending on the exact materials used and climate conditions these types of roofs should last from 10 to 30 years. Roll asphalt roofing has been the traditional method for sealing flat roofs for years. One layer of asphalt impregnated organic or fiberglass felt is laid on the roof and fastened down with galvanized nails and roofing cement. A final covering of crushed gravel or other mineral product is placed on the surface. Roll asphalt has a limited life of about 10 years. It is common to find this type of roofing system used on garages and sheds. It is the most economical flat roofing system available. Single ply membranes are a product that must be installed by trained professionals. Consisting of either a thermoset or thermoplastic membrane they are placed on the roof in a single piece. With proper care and maintenance a single ply membrane will have an average life of 10 to 15 years. An SPF roof is seamless. It consists of a layer of foam, covered with a resilient coating which seals and protects the surface. SPF has been around for over 30 years. It requires specialized equipment and professional installation. All flat roofs need to have some preventative maintenance which includes removal of debris such as dirt, leaves and tree branches. Gutters and downpipes should be cleaned to allow for the unimpeded flow of rain water. The flat roof should also be inspected periodically for damage with special attention paid to areas where flashing has been used. Note: Fireworks are a major problem for flat roofs, especially those with membranes and polyurethane foam, as both of these products melt when exposed to high heat or flame. Do not set off fireworks if there is any possibility that the falling debris could land on a flat roof!